Evaporative Cooling Units & Fans! Portable, on the spot cooling where you need it. Lowers the temperature an average of 15 to 25 degrtees F.
Operates on tap water and 115v of electricity for pennies a day. 3/4" garden hose connection supplies water. Easy setup and operation. Ready to setup right out of the box. Durable, rotationally-molded plastic housing is rust-proof and leak-proof. 16" Variable Speed, 1/3 h.p. high performance, belt drive. Cooling Capacity 1,000 sq. ft. Perfect for Repair shops, Outdoor events, Military Applications, Ect. Available in 4 sizes and 19 models to fit your needs. 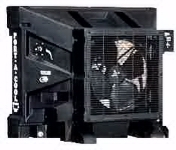 Cooling Capacity 1,800 sq. ft.
Cooling Capacity 4,000 sq. ft.